When you book a room on ocmdhotels.com, we guarantee you won't find a lower rate anywhere else. If you do, simply call us at 1-800-638-2106 and we will match the rate. Our guarantee applies when you find a lower rate available to the general public anywhere online for the same hotel with the same dates of stay, same room type, same cancellation and advance purchase policies. It does not apply to rates offered only to members of specific group or organization. Nor does it apply to rates purchased through an "opaque" website. Please call the hotel directly to ask about open positions. If you would like to apply to a hotel or restaurant, please print out the application below and deliver it in person to the property of your choice. We own and operate 10 Oceanfront Ocean City MD Hotels and guarantee the best online rates. Choose from oceanfront & boardwalk rooms, luxury suites, efficiency units, fully equipped kitchenettes & spacious guest rooms. All in beautiful Ocean City Maryland. When you book a room on ocmdhotels.com, we guarantee you won't find a lower rate anywhere else. If you do, simply call us at 1-800-638-2106 and we will match the rate. Our guarantee applies when you find a lower rate available to the general public anywhere online for the same hotel with the same dates of stay, same room type, same cancellation and advance purchase policies. It does not apply to rates offered only to members of a specific group or organization. Nor does it apply to rates purchased through an "opaque" website. Delicious food, live music and an exciting variety of family fun. 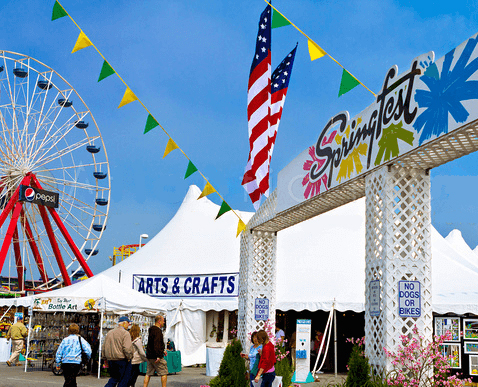 When the Springfest tents go up on Ocean City’s beaches, summer isn't far behind! Home for the Holidays is a magical experience for the whole family that will dazzle, delight and captivate audiences. The hit Broadway show and phenomenon by QUEEN and Ben Elton is coming to the Ocean City Maryland for one night only, Friday, November 8, 2019! Back by popular demand, The Doo Wop Project returns to Ocean City on October 10th. Subscribe to our newsletter for special offers, discounts and more! Looking to become a team member? Apply for a fun and rewarding position now! Update your account information here.